How to cook an Elephant. : Shellfish: are they the new antibacterial wonder of the world? A good friend of mine informed me over a lunch of fish and prawns, that the lovely little sea creatures I was munching on had antibacterial properties in their shells. She then went on to explain that, that was the reason why she ate them with their shells on. Infinitely more crunchy, but definitely less hassle. Was there more than the munch of sweet prawn flavour, and the crunch of shell? Chitosan is a deacethylated product of chitin which is a major component of prawn shell and squid pen. The compatible biopolymers (from prawn shell and squid pen) exhibit anti-bacterial, anti-fungal properties and enhance wound healing and hemostatic activities. Various forms of these products have been modified to use in medical applications. Chitosan, in combination with bentonite, gelatin, silica gel, isinglass, or other fining agents is used to clarify wine, mead, and beer. Ironically enough various forms of Chitosan are known to reduce E.coli count. Everyone knows the effect of the dodgy prawn, which is caused from Vibrio parahaemolyticus or Aeromonas hydrophilia. Since E.Coli is also water borne The dodgy prawn syndrome (food poisoning) could also cause this. I held an all you can eat sushi party recently, and for the life of me, I couldnt get the prawns right! Mine looked like boiled snails, except they were red, and very tasty... I came across this recipe a week later (I didnt have the luxury of Internet at home at that stage- as you can see from my once monthly blogs, not once weekly as I want). The trick is the boiling liquid contains vinegar and sake, and the prawns are boiled with their shells on, while being skewered! Remove the dark vien in the prawn while keeping it whole. Place a bamboo skewer through the shell of the prawns from the leg side (do not pass the skewer through the flesh. Bring a saucepan of water to the boil. Place the sake, rice wine vinegar and salt to the pan and reduce it to a simmer. 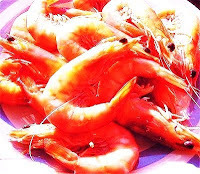 Place the prawns in the pan and cook them for 2 minutes so that they are just cooked. Remove the prawns from the pan and refresh them in ice cold water. When the prawns are cold remove the skewer and peel the prawn leaving the tail end of the shell still attached. To butterfly the prawns make an incission on the underside of the prawns so that you can open them up and flatten them (be careful not to cut through the prawn). Flatten the prawn out to butterfly them for using as a topping for nigri sushi.